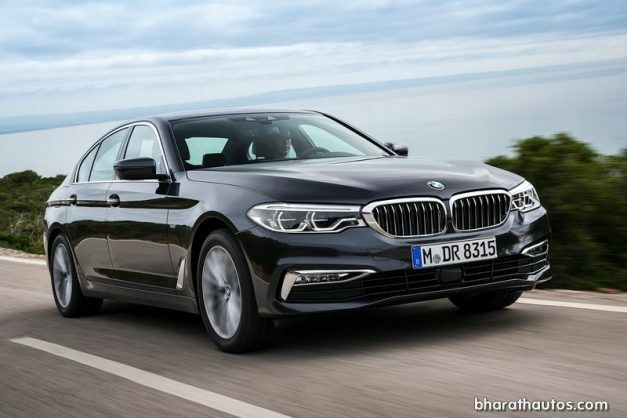 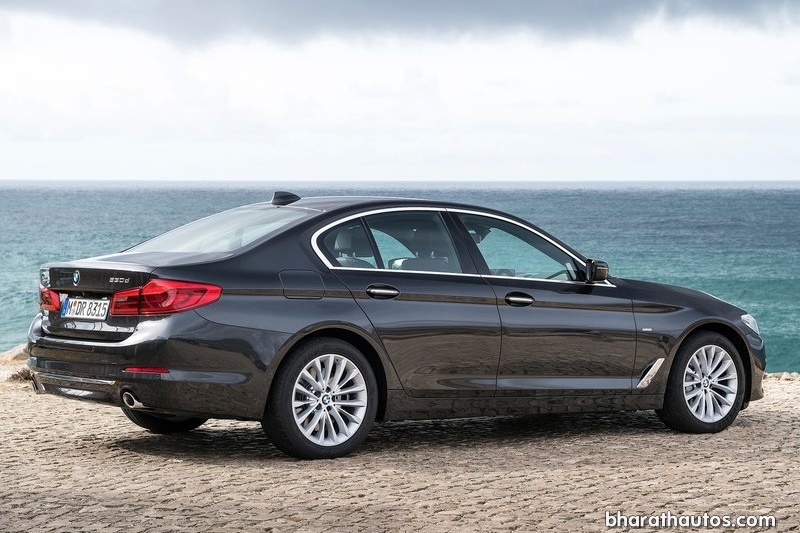 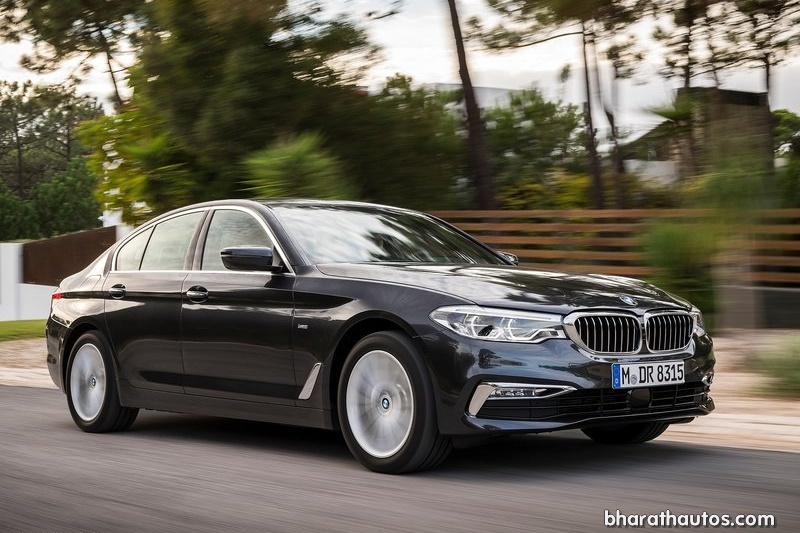 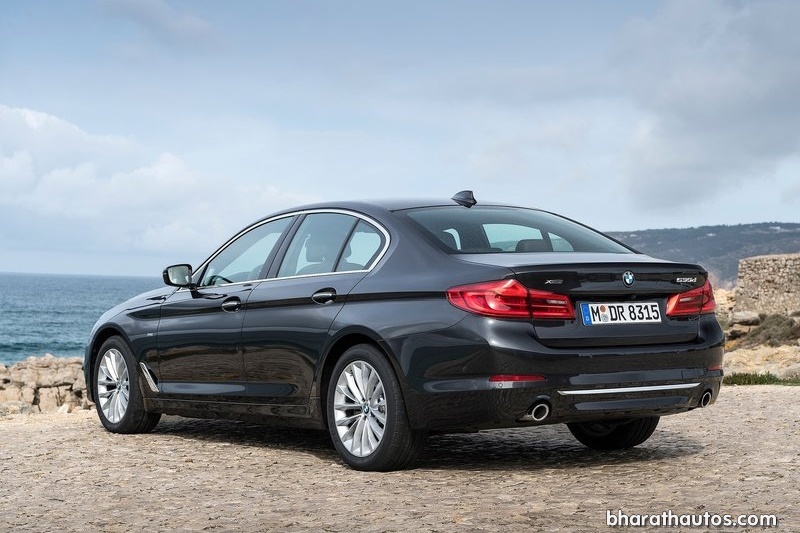 BMW India has officially launched the 7th-gen BMW 5-Series sedan in the country, its available in 3 diesel – 520d Sport Line, 520d Luxury Line, 530d M Sport and one petrol variants, the 530i Sport Line. 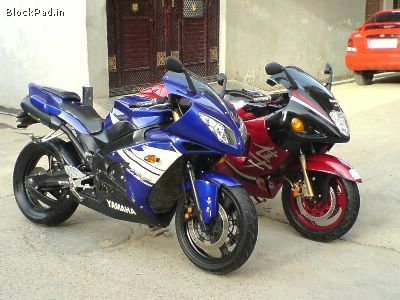 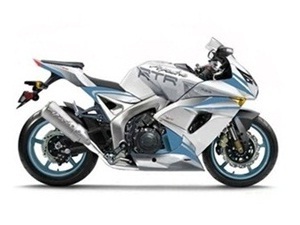 The price starts from Rs. 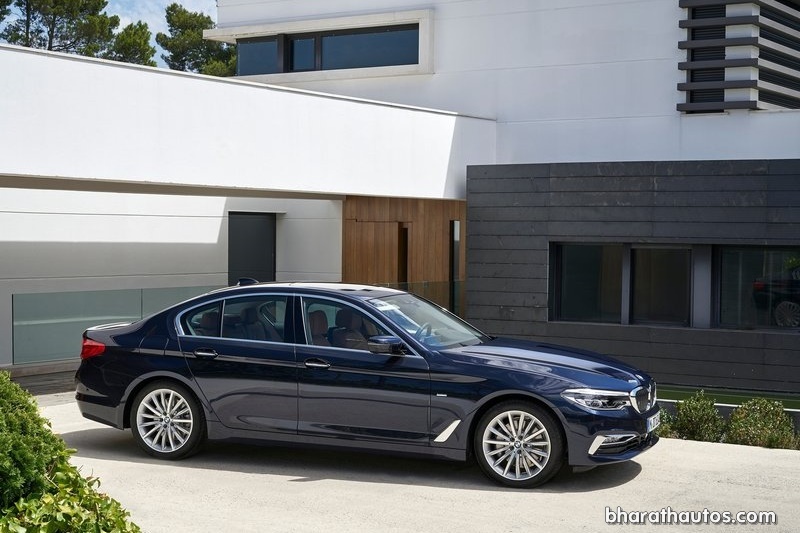 49.90 lakhs for the new Munich’s benchmark executive sedan, and is already on display at some BMW showrooms across India. Based on BMW’s Cluster Architecture (CLAR) platform, the seventh-gen brings a big change to its proportions being 37 mm longer, 8 mm wider and 17 mm taller than its predecessor; its wheelbase too is 7 mm longer at 2,975 mm. 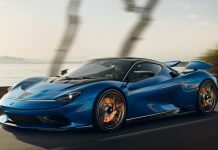 The aluminium, high-tensile steel and magnesium construction has shaved off as much as 70 kg from its predecessor, whilst also improving body strength and torsional rigidity. 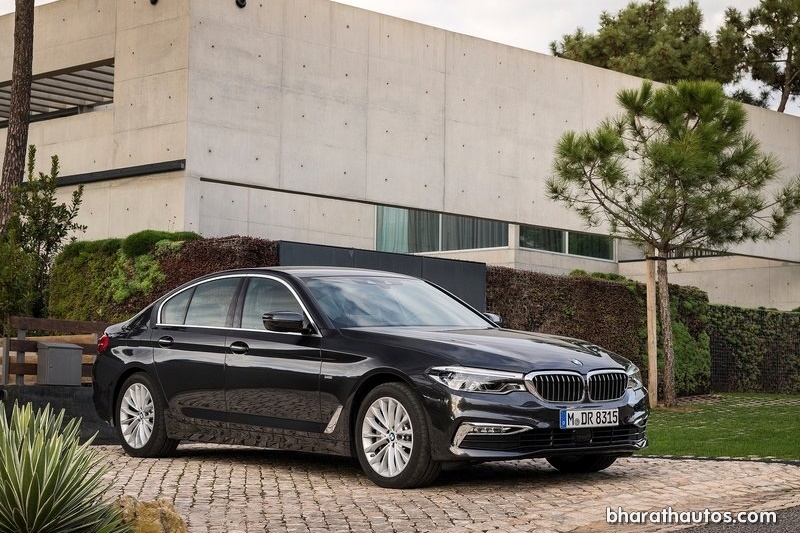 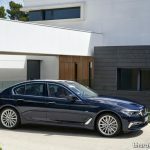 The new 5-Series look very much like a baby 7-Series, especially the headlights that flow into the double kidney grille as well as the sleek side profile for some extent. 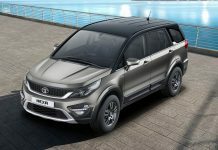 At the back, the car gets distinctive look with sporty bumper and L-shaped LED tail-lights. 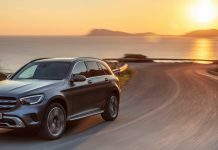 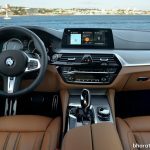 Inside, the 2017 5-Series is light years more modern than its earlier counterpart, striking a fine balance between sporty driver focus on the one hand and sophisticated elegance on the other. 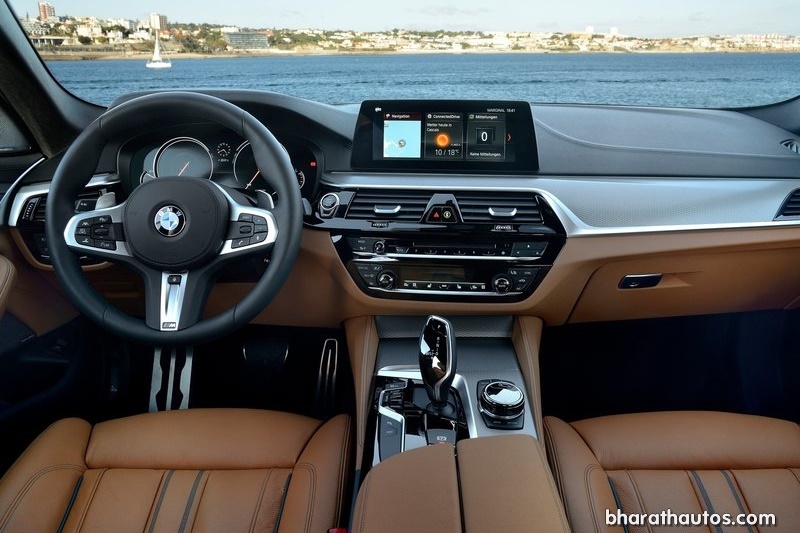 Feature-wise, the top-grade 530d M Sport comes equipped with Head-up Display, fully digital instrument cluster, adaptive LED headlamps, 4-zone climate control, 360-degree camera, wireless phone charging, remote parking function via BMW Display Key and a Harmon Kardon audio system. 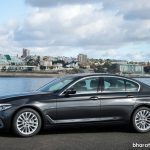 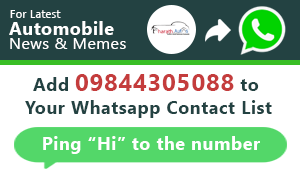 Gesture control for key functions that was introduced in the 7-Series, is now featured on the 5-Series but a latest version. 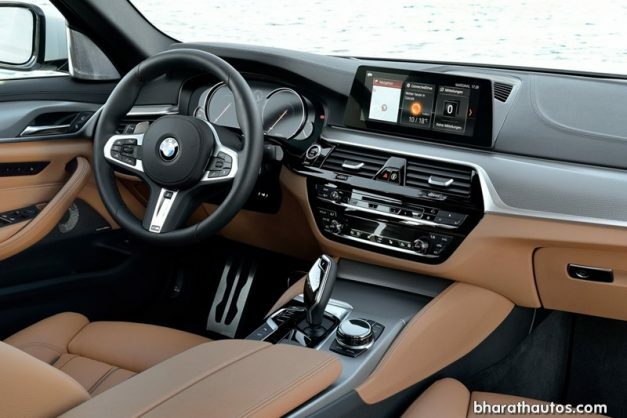 Navigation, telephone, entertainment features and vehicle functions can be visualised on the optionally available high-resolution 10.25-inch screen and controlled not just in the usual manner using the iDrive Controller, but also by means of gestures, voice commands or simply touching the buttons on the display. 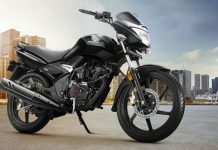 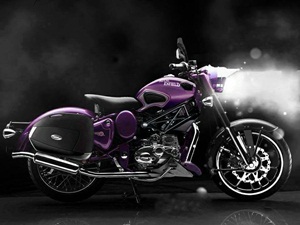 For Indian market, BMW has launched two diesels and one petrol engine options. 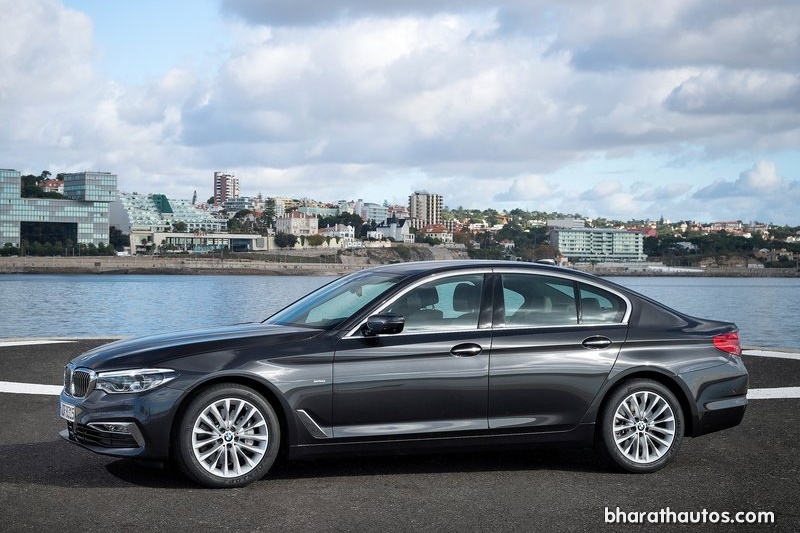 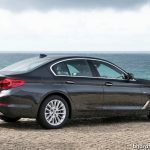 The top-end 530d that comes with M-Sport package as standard, is powered by a 3.0-litre, inline-6 diesel engine rated at 261 BHP and 620 Nm, while the 520d sporting a 2.0-litre, 4-cylinder, diesel engine develops 187 BHP and 400 Nm. 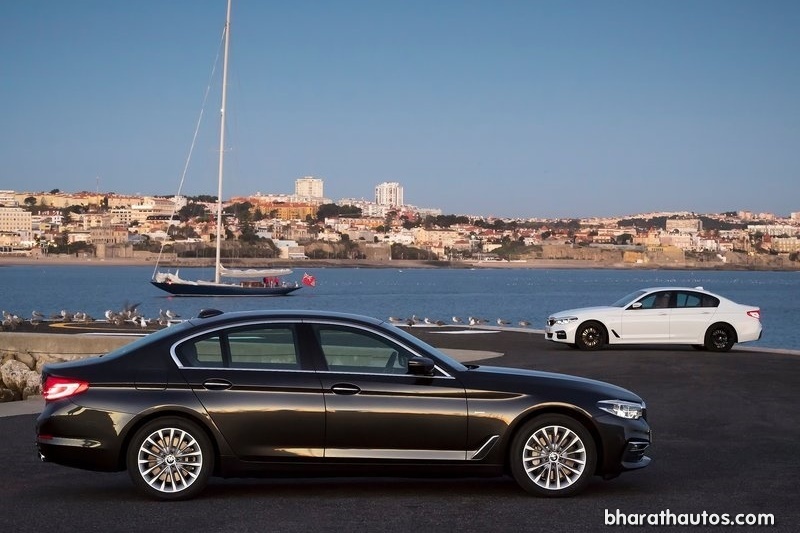 BMW is also offering the 530i that sports a 2.0-litre petrol motor that produces 249 BHP and 350 Nm. 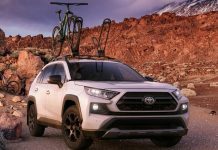 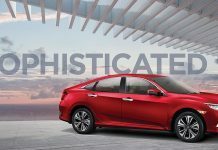 All the engines come with a ZF 8-speed automatic transmission, so is the adaptive suspension system with independent damping for all-four-wheels. 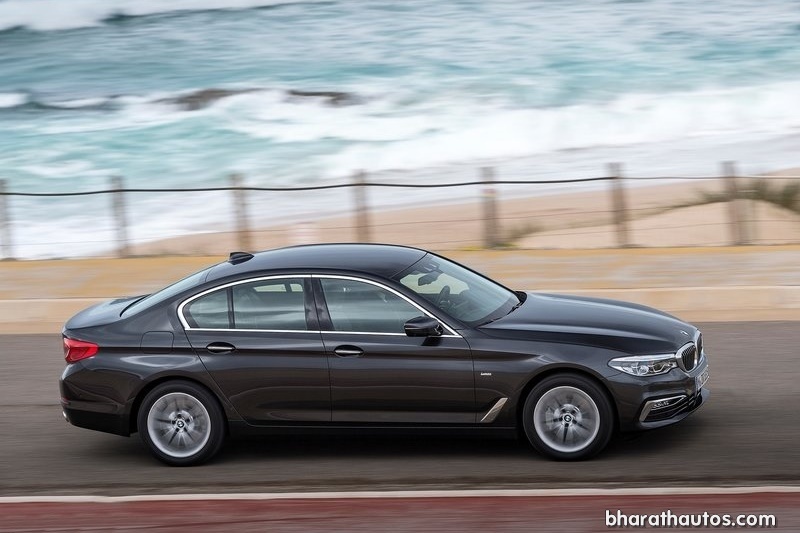 As far as safety is concerned, the 7th-gen 5-Series get six air bags, anti-lock braking system (ABS) with brake assist, dynamic stability control (DSC) including dynamic traction control (DTC), cornering brake control (CBC) and hill descent control (HDC). 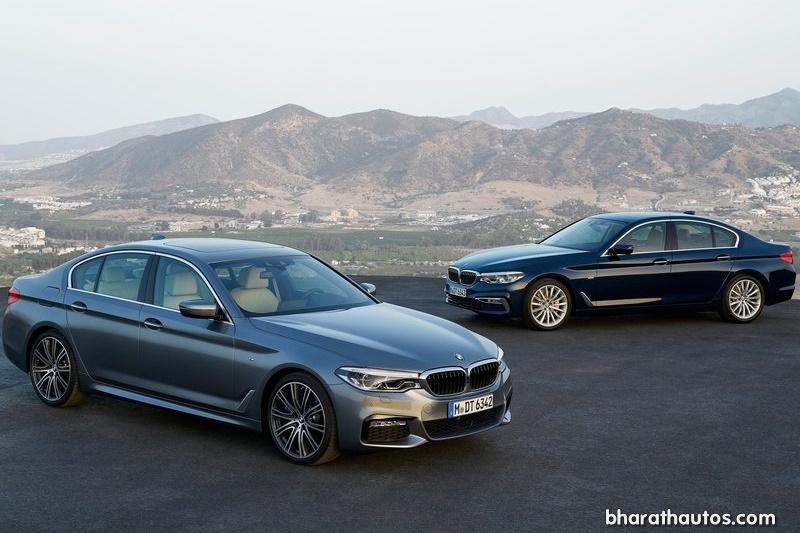 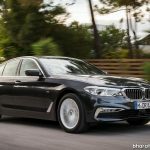 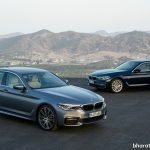 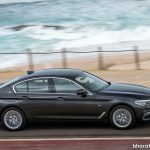 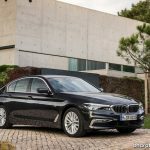 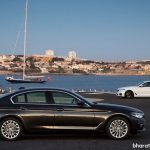 The new 5-Series competes with the recently launched Mercedes-Benz E-Class LWB along with the Jaguar XF, Audi A6 and Volvo S90. 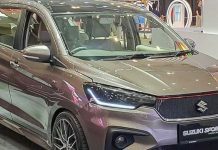 Previous articleThis DC designed Vitara Brezza is a marvelous one to look at!